I feel like I’ve just been sworn into college; I pulled my first all-nighter. Well, al most. I am currently functioning on three hours of sleep. Although I had been preparing over the weekend and in the beginning of the week, I was panicking about my first exam in my most difficult class. I don’t even drink coffee, but you can bet I did all day yesterday. The exam was on China, Japan, and Vietnam from B.C.E. times to the 20th century. There would be twenty-five points of combined multiple choice and matching. The largest point value would lie in the essay. We had to write one essay, but we were given three possible essay topics; only two would appear on the exam. I chose to thoroughly write a summary of two of the topics, ensuring one would appear on the exam. I also made an excel spreadsheet, organizing the dynasty, the emperor and the time period. These tactics proved to be very helpful; to be honest, I think I did well on the exam. Now if you’ll excuse me, I need to take a nap before my next class! I guess I had some kind of preconceived notion, with the exception of exam preparation, that the library was for losers. Yet, I’ve recently discovered the opportunities the library offers to students. Sure, libraries can be somewhat outdated, because who wants actually look for a book when you could just type the question into your search box. However, spending time in the library actually has a lot of peaks. I, personally, can focus much better in a quiet environment. The best thing about the library is you don’t feel rude demanding silence. Gumberg Library has designed the bottom three floors as quiet floors, where you can fully dedicate your attention to your studies. Not that I can complain about my roommate; she is often quiet when I try to do work, but working in the library eliminates the lack of consideration. T he library also has Wi-Fi, so after class, I grab my laptop and head over. Obviously, research and note taking are made easier, yet I also find that sometimes I need a Facebook break or I want to listen to a song with my headphones. Because the library is a Wi-Fi hotspot, this is a possibility. 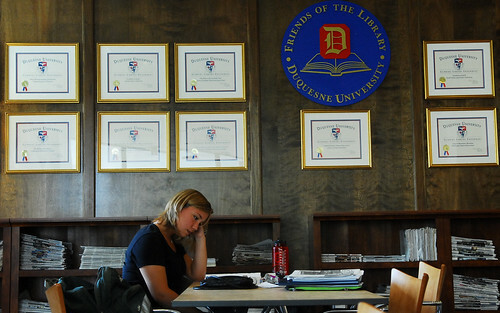 I also find studying at the library refreshing (aside from the revitalizing air conditioning). Because I can truly focus, I find I actually understand what I am reading and cut the amount of time I need in half. Even if you never pick up a book (I haven’t yet! 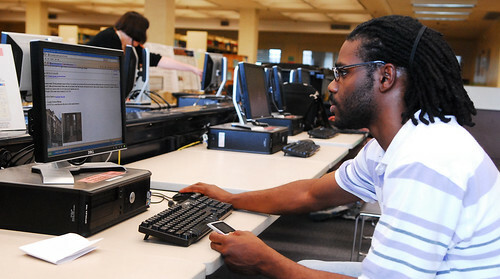 ), the library is still a great resource to take advantage of!